Learning scales without Tabulature can be a quicker way to get to grips with the guitar. It will involve patterns and of course learning the notes on the strings. 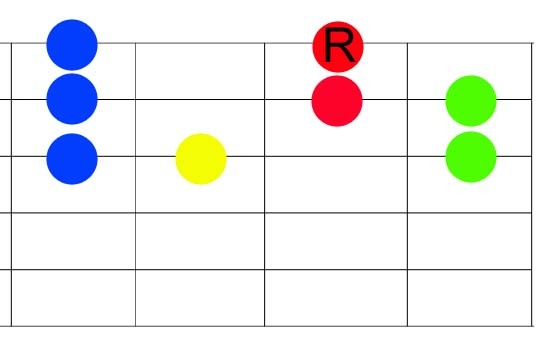 These patterns are useful because they are movable in the same way that a barre chord is movable. If you’ve already looked at TABS of scales you may be aware of common patterns. 1 octave major scale pattern. Below is the TAB(tabulature) version – they should be exactly the same. If they’re not then you’ve misunderstood. 1 Octave A Major Scale. The nice thing about patterns like the one above they make you think more and learn the notes rather than rely on tabs. The Red circle with the ‘R‘ is the root note – the red circles are fretted by the 2nd finger. The Green circles are your 1st finger. The Yellow circle is your 3rd finger. The Blue circle is played by your 4th finger. By playing the pattern above starting at different frets gives us different major scales. It would be good practice to learn other patterns as well as these and I will cover those in future articles. Also a good working knowledge of the guitar strings and their notes will be imperative to you taking this further.